August 8, 1988 – Version 1 of the business systems released. This is the first integrated business software to support mouse, menus, a complete graphic interface, X-Card coding, user-enabled report making, and hyperlinks. February 20, 1991 – Modules now support Retail and Wholesale Sales; Services; Equipment Rental, Party Rental, Event Rental, and Tent Rental. May 9, 1995 – Simple Solutions recommends retiring dot-matrix printers, provides support for laser and ink jet printers. August 9, 1998 – Simple Solutions completes porting of systems – to new, faster, more powerful RISC architecture computers. February 21, 1999 – First competing system with a graphic interface ships. It lacks X-Card coding, user-enabled report making, and hyperlinks of the 1988 Version 1. July 8, 1999 – Modules are added to support manufacturing. February 22, 2002 – Version 10 ships. This version is a complete “ground up” rebuild of the systems. It incorporates everything learned in the previous decade and a half, with new code, a new interface, and more programs. June 7, 2006 – Version 15 ships using the Version 10 interface, with new report maker, new Data/Editor database architecture, new list maker, and new programs (Payment Applicator, Inventory Pricers, Transaction recaps, etc.) Version 15 is OS X native, Intel native, and very fast – up to 6 times faster on the same hardware. July 7, 2007 – Simple Solutions introduces the Modular DataCenter. At less than $2000, It provides more flexibility and better data backup than systems costing hundreds of thousands of dollars. February 4, 2008 – Version 2 of the ARP ReportMaker is launched – adds more positioning tools, improved referencing of external objects, and more helpful help. May 15, 2008 – Simple Solutions President, Paul Looney, delivers the speech on Data/Editor databases at international RunRevLive programming conference. August 8, 2012 – Version 18 is released. It has over 200 documented improvements and introduces the new Socket Server. 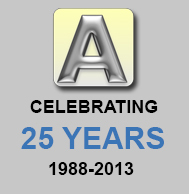 December 12, 2012 – The 25th anniversary User Guidebook is published. It introduces the entire system in one hour average reading time. Lots of pictures. Download from this website. July 7, 2013 – The new Admin Guidebook is published. This is the first time there has been a specific manual for administrators who setup, modify, and maintain Ahsomme systems. A copy is available to all customers.